We build up real relationships that bring tangible benefits to our partners and to us. 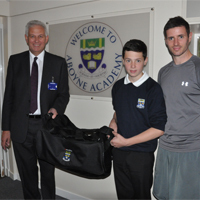 ARCADION are keen to improve and promote business engagement in schools and have a long established Partnership Charter with Aboyne Academy whose students are both learning from us and bringing us new ideas and a fresh perspective. From an initial introduction in 2012 we established a Partnership Charter with the school and have built a strong two-way relationship with both students and staff. At a practical level, ARCADION have provided new equipment to various departments including Design and Technology and Home Economics. Various workshops have also taken place covering elements of Projects and Design to compliment the schools curriculum and, as further preparation for the world of work, we have run sessions on preparing CVs, letter-writing and honing interview techniques. To recognise the students' fantastic academic achievements, we introduced a number of annual ARCADION awards — one each in Design and Technology and Business Management and two for Outstanding Individual Achievement. Always keen to be involved with the curriculum, staff and pupils at Aboyne Academy, ARCADION are delighted to be part of the judging panel for the annual Youth and Philianthropy Initiative - the YPI programme is currently delivered in 110 Scottish secondary schools by the Wood Family Trust and is included as part of the school’s curriculum. Pupil teams research a local social service issue they feel passionate about and identify an appropriate local charity to work with. The group with the most discerning and impassioned argument wins £3000 for their chosen charity. More recently ARCADION were present at the school's first ever Business Breakfast to encourage other local businesses to get involved with the school. Speakers included Clive Gregory, ARCADION Technical Director, Lorraine Scott, Aboyne Academy Head Teacher, and Mark Smith, a pupil in his final week of school who spoke at the event regarding his work placement with a local electrical company. Clive Gregory said "In order to ensure we have the skills needed by local business to grow our economy, connecting our schools to jobs in the market is key. The more we can grow our skill base, the more wealth we retain in the region. Our partnership with Aboyne is not about being a source of cash, although we try to help where we can, but more about providing real life demonstrations of how we function as a business, how young people can engage with that to enhance their own prospects for employment and for the development of both our own and the school's faculty working in these different areas".